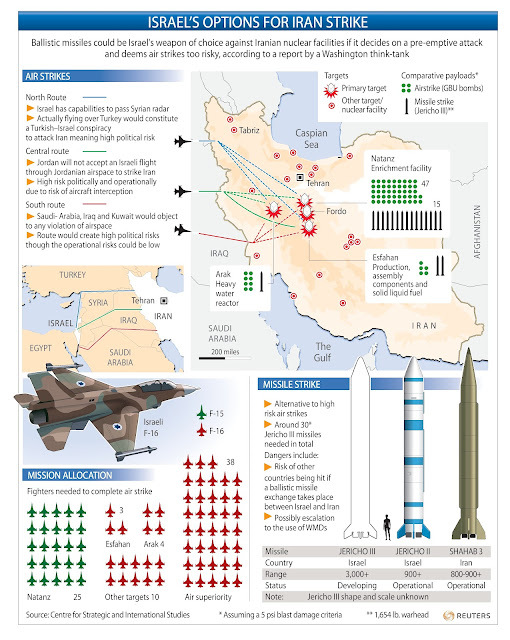 The Middle East and Iran: Will Israel Attack Iran with Long-Range Missiles? Will Israel Attack Iran with Long-Range Missiles? I just came across a fascinating article from MSNBC's Open Channel analyzing how an Israeli attack on Iran might unfold. While almost all of the previous articles I have seen that analyze Israeli attack on Iran scenarios tend to focus on Israeli airstrikes, the Open Channel article by Robert Windrem examines the possibility of Israeli long-range Jericho missiles being used as a central part of the attack. As a recent NY Times article noted, an Israeli attack on Iran conducted entirely or primarily by airstrikes would be extraordinarily difficult given both the number and underground locations of Iran's nuclear sites, so it seems entirely possible that Israel would use a multifaceted approach in an attack on Iran that used a combination of airstrikes, missiles, cyber warfare and special operations forces. "Two words: Jericho missiles," said one former White House and Pentagon official, speaking on condition of anonymity, when asked how Israel would attack Iranian targets at great distances. "They are conventionally armed, have a very small CEP (circular error of probability, meaning they are highly accurate) and can be used in conjunction with a strike fighter operation." Let us hope that it does not come to war, but if it does, it may well start with missiles launched from bases in the Negev on a cloudy night. Do read the entire Open Channel analysis.